this potato soup will hug you…be comforted. I thought twice about posting a potato soup today. I mean, after all…it is spring. Well, it is cloudy. It is 50° outside. I decided to post it anyway. In a large pot heat the olive oil over med high heat and cook the onions and celery until softened. Add the potatoes and mix together coating the potatoes well. Season with salt and pepper. Continue cooking for 5 minutes. Add the boiling water, increase to high heat and bring back to a boil. Lower heat to a slow boil and continue to cook 15 minutes until potatoes are tender. Meanwhile, melt the butter in a sauce pan. Whisk in the flour until smooth and thick. Stir in the mustard and add the milk continuing to whisk until a smooth sauce forms. Stir in the steak sauce. 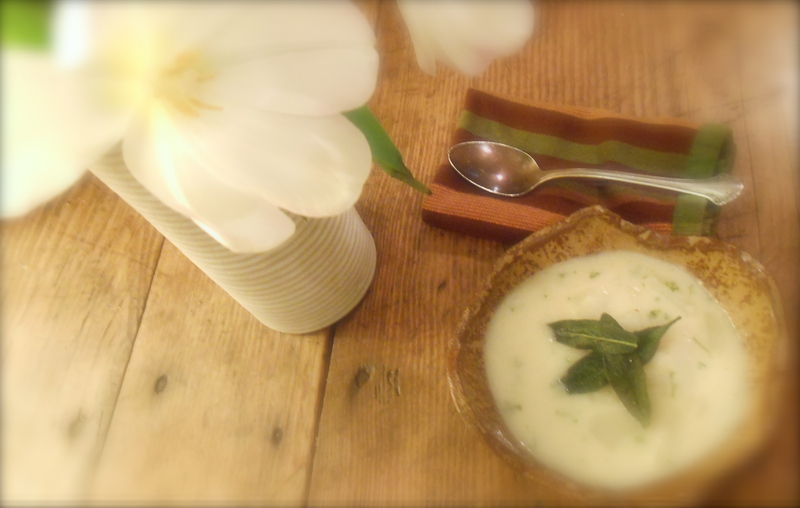 § One Response to this potato soup will hug you…be comforted. I love potato soup. I definitely like to fry some bacon in the pan first, then remove and add over the top of the soup at the end. I make this a lot as we have a lot potatoes as hubbie works on an organic veg farm. I have never made it before making a separate white sauce or with steak sauce. Always good to find ways to tweak an old recipe. You are currently reading this potato soup will hug you…be comforted. at COTTAGE GROVE HOUSE.